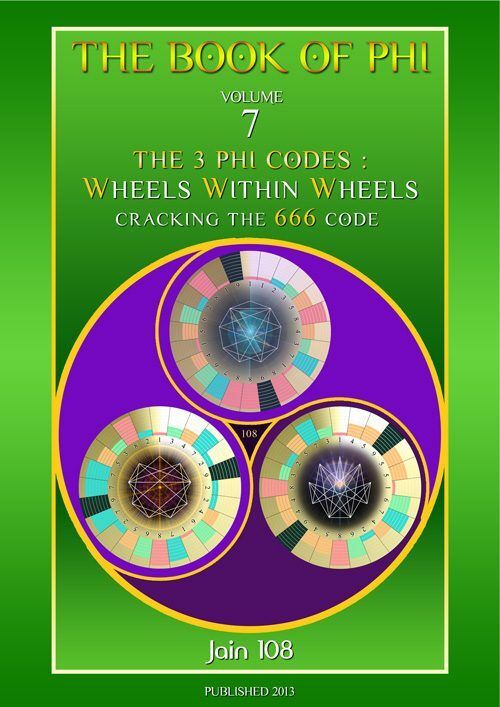 ⦁ This book is a distillation and summary of The Book Of Phi, volume 1 published in 2002. 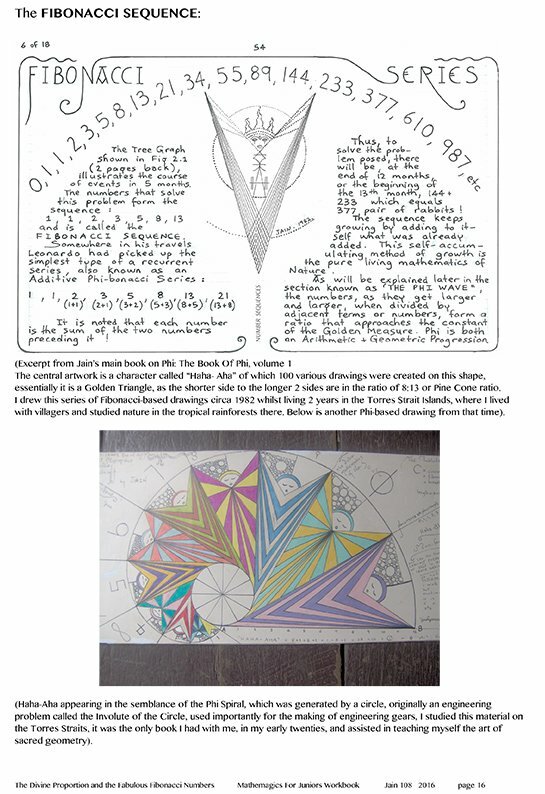 ⦁ Its basic premise is to view Mathematics as Pictures or Power Art, that is recognized as Feminine, Right Brain Mathematics. 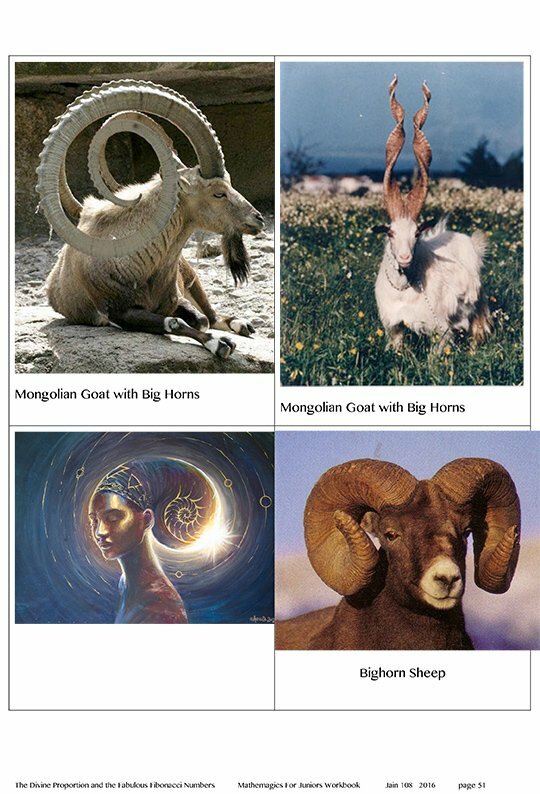 Its like the reader is putting on X-Ray goggles to see Numbers as Shapes: the Universal Language of Pattern Recognition. 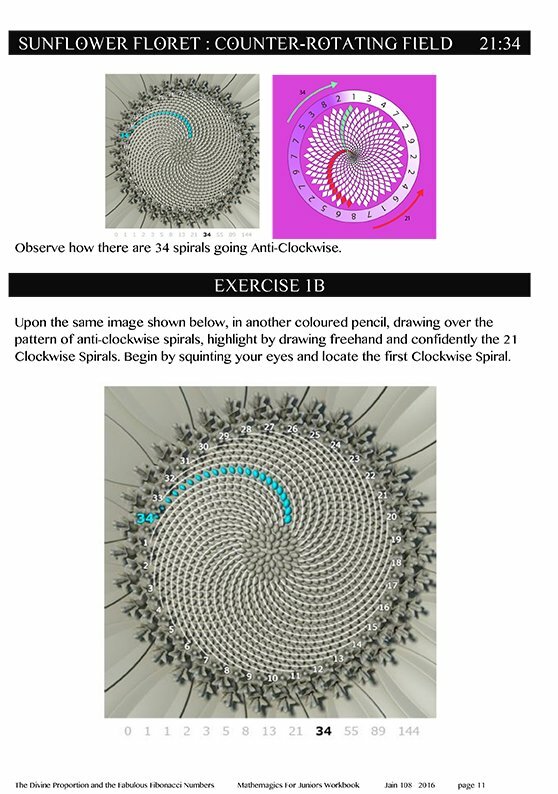 ⦁ Jain explores the Fibonacci Sequence and magically transforms it into exquisite Art. 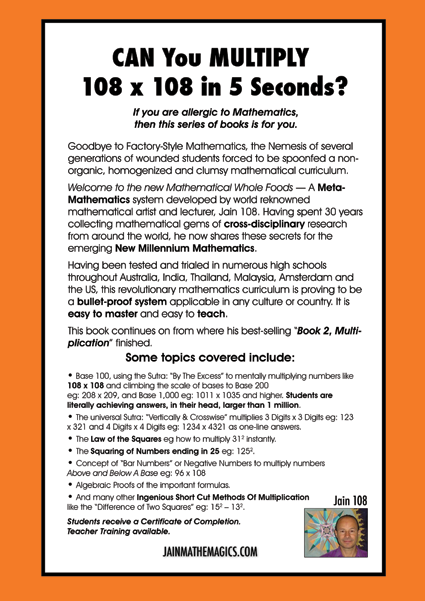 ⦁ Great for teenage students wanting to further their love of Numbers and great for adults who are willing to learn again. 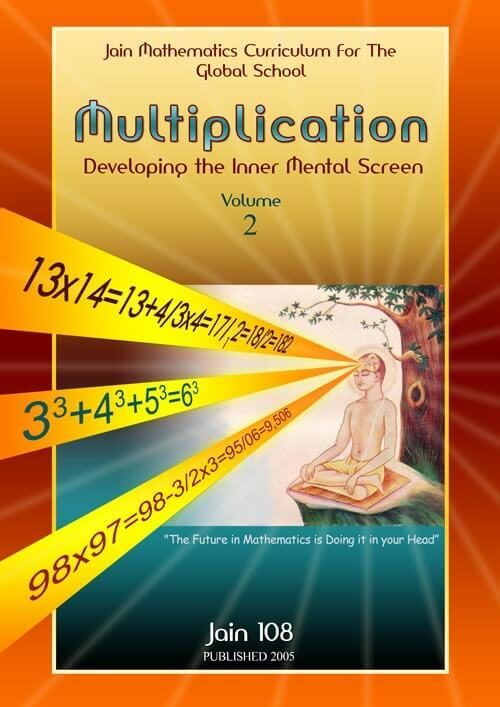 ⦁ Jain believes that if most students who struggled with mathematics were to simply have studied these mathematical patterns, and not learnt their algebra and trigonometry as required, would have seen life through another lens and developed a deeper appreciation for the Beauty of Mathematics. 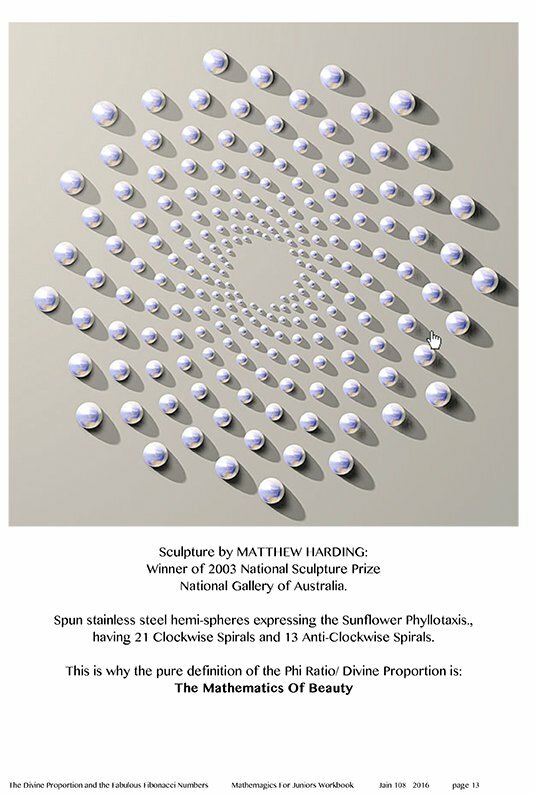 This book contains 140 pages, mainly computerized, highly illustrated, the book is a golden rectangle but fitted or orientated to A4 portrait, and perfect bound. 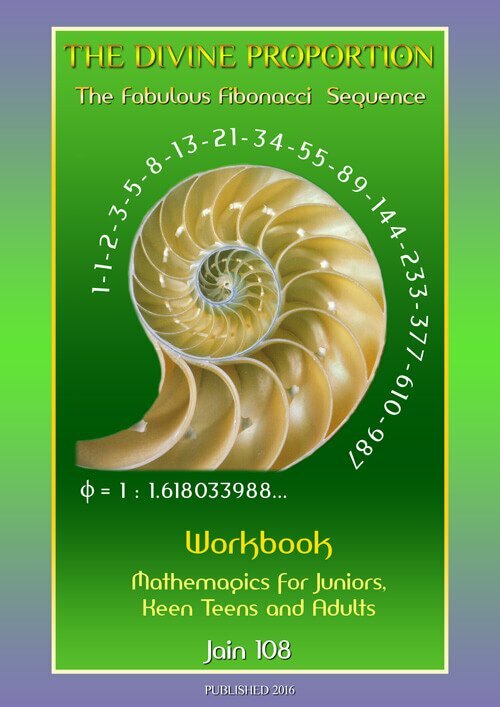 sub-titled: The Fabulous Fibonacci Sequence: the Living Mathematics of Nature is the key to understanding the Golden Mean or Phi Ratio, is Jain’s 6th Workbook for Children of ages 9 years and over. 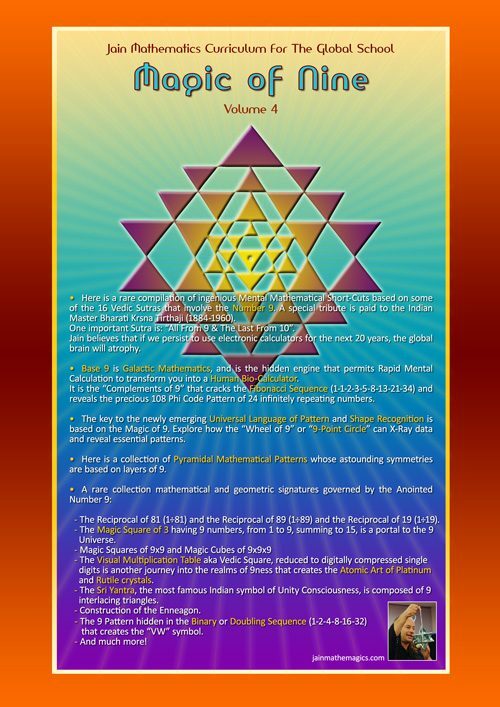 Available for the international and online curriculum, this content provides insight into Fractality, Galactic and Atomic Mathematics. 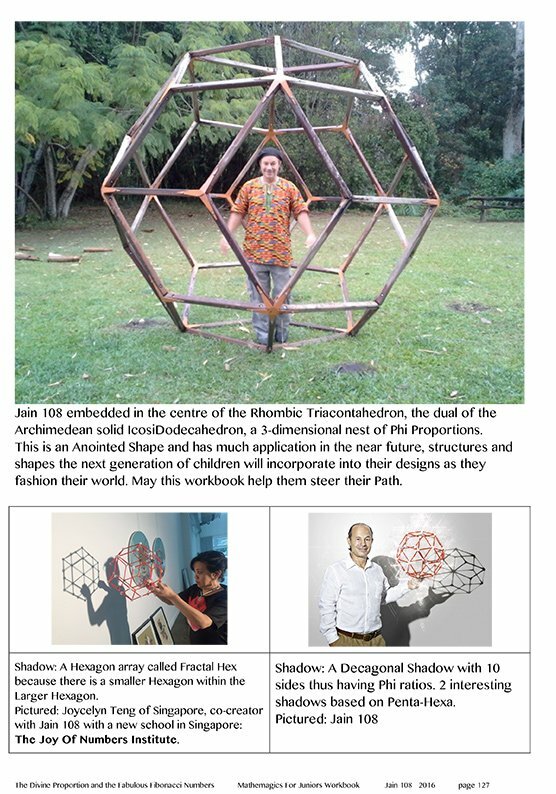 ⦁ Jain 108 of Australia has distilled the last 30 years of his research towards the re-introduction of Sacred Geometry back into the public school curriculum. 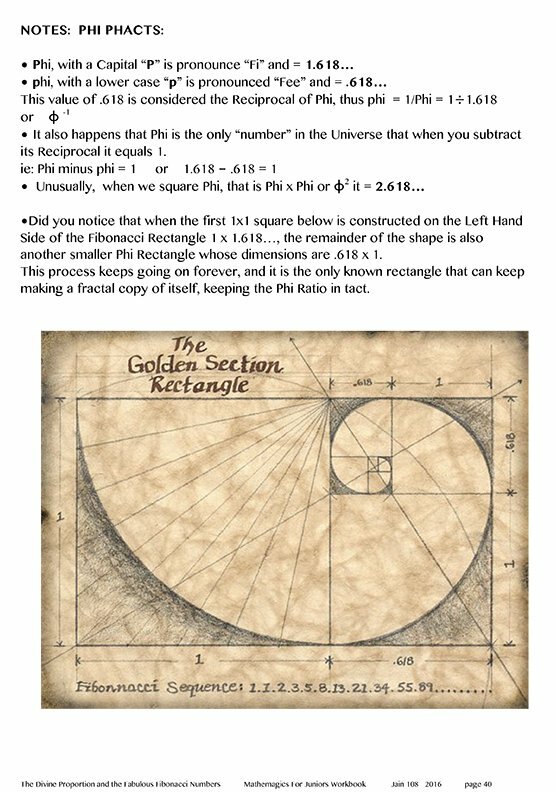 ⦁ 100 years ago, topics like the 5 Platonic Solids, the Fibonacci Sequence and the Golden Mean Spiral were highlights of a national curriculum handed down to us for over 2,000 years since the Greek empire. To our detriment, heads of government made the decision, 100 years ago, to remove this legacy from the national curriculum. Since then, students world-wide have shut down from learning mathematics due to its current dry, factory-style content. 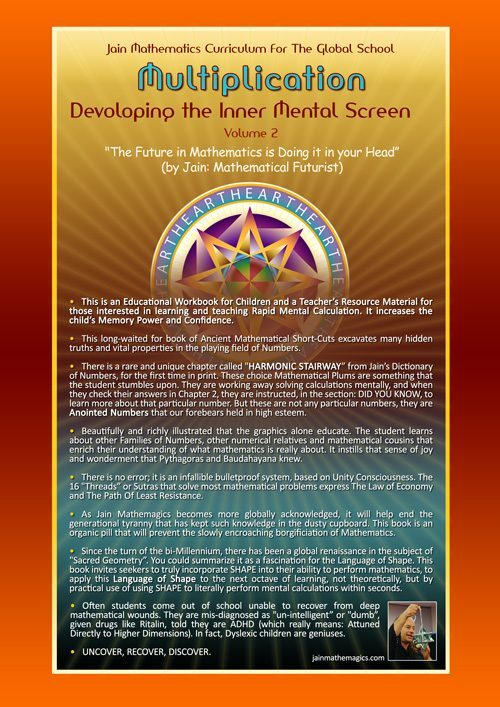 Jain Mathemagics is merely putting back into the curriculum that which was already there! Jain succeeds in communicating to Youth in a highly visual Language permitting the Students to understand the in-depth meanings of concepts like: Fractality, Infinite Series, Scale Invariancy etc. ⦁ “If I were to leave this planet and leave one gift that would best serve me to be remembered by or to share gems of knowledge, it would no doubt be this Compendium. 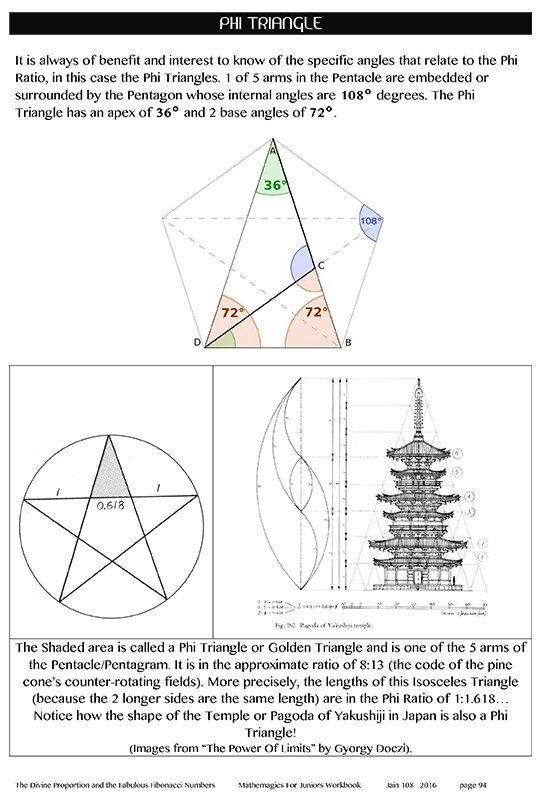 I am excited to release these gems in the exciting year of 2016, a time when many hidden or esoteric studies are being raised into full view. 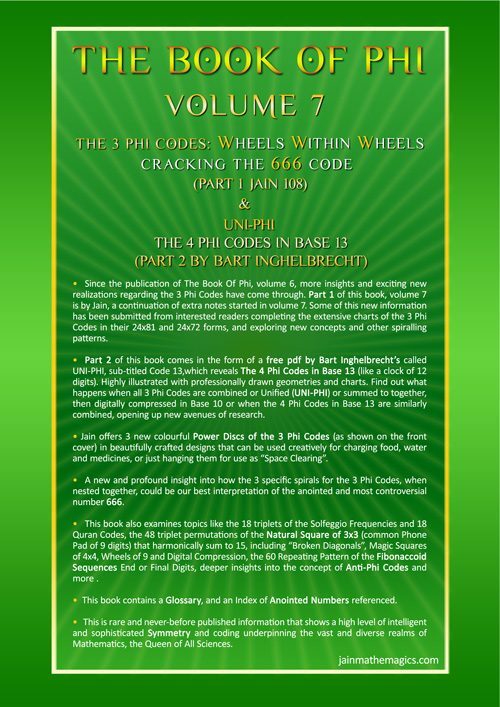 I believe that these simple Mathematical Codes are Celestial Transcripts and are part of our Ascension Process”. ⦁ Get involved with your Child’s education. 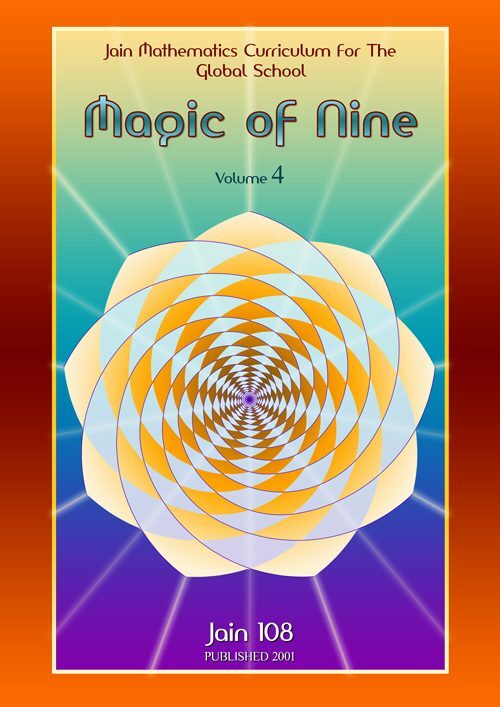 This highly visual curriculum for Children aged from 9 onwards is the first Miniversity of its kind, introducing young children to the fascinating world of Sacred Geometry and Mandala Creation. A must for all Keen Teens and Adults wishing to learn again. 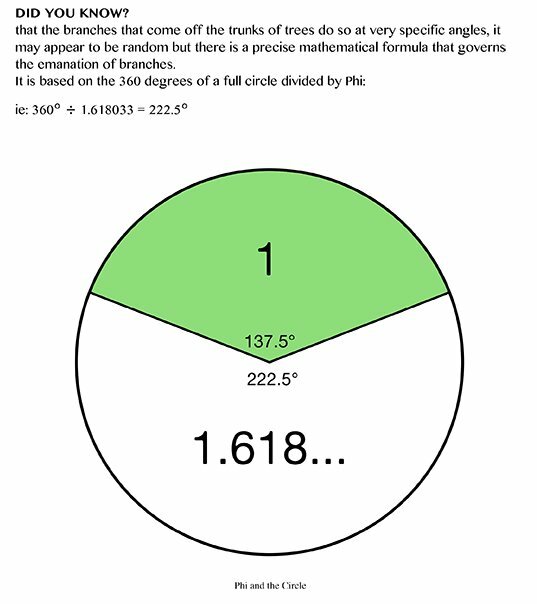 The Divine Phi Proportion is a highly visual presentation of the ancient branch of mathematics called Sacred Geometry. 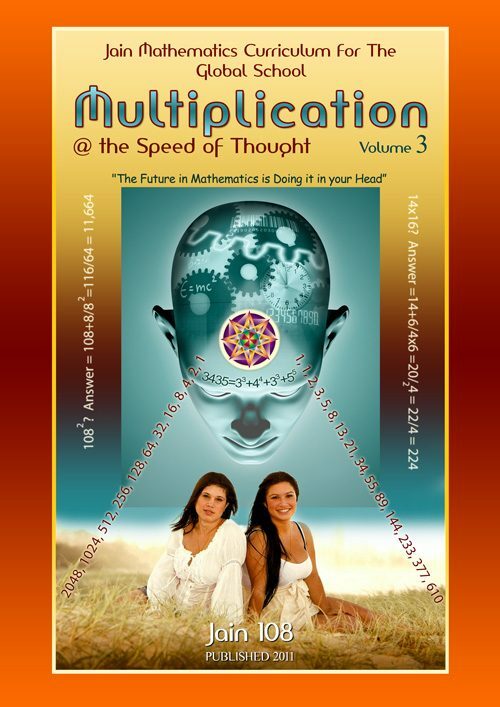 It is encouraged that these Starkidz learn these 10 lessons as a supplement or complement to learning their Multiplication Table which is also recommended for 9 to 12 year olds (Mathemagics For Juniors). 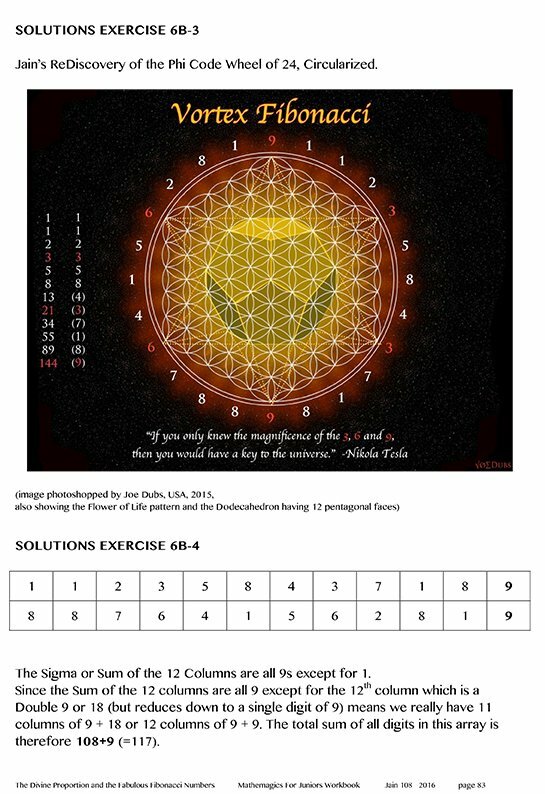 When the Numbers (Male Left Brain) of a Magic Square are translated into a Picture, it creates Whole Brain Learning or Feminine Right Brain Mathematics that responds to pictures. 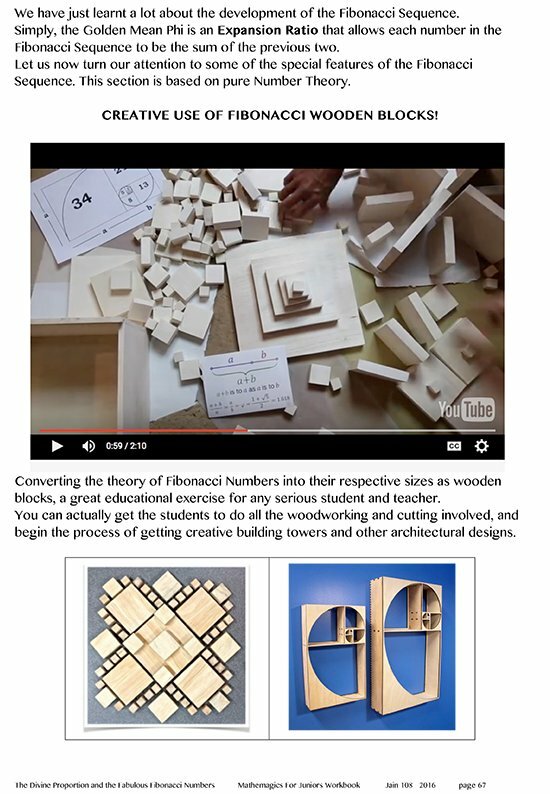 This course teaches the Beauty of Mathematics and Geometry. A lot of this material was in the original Greek syllabus 2000 years ago and it got taken out about 100 years ago. Jain is merely putting back into the curriculum that which was always there. 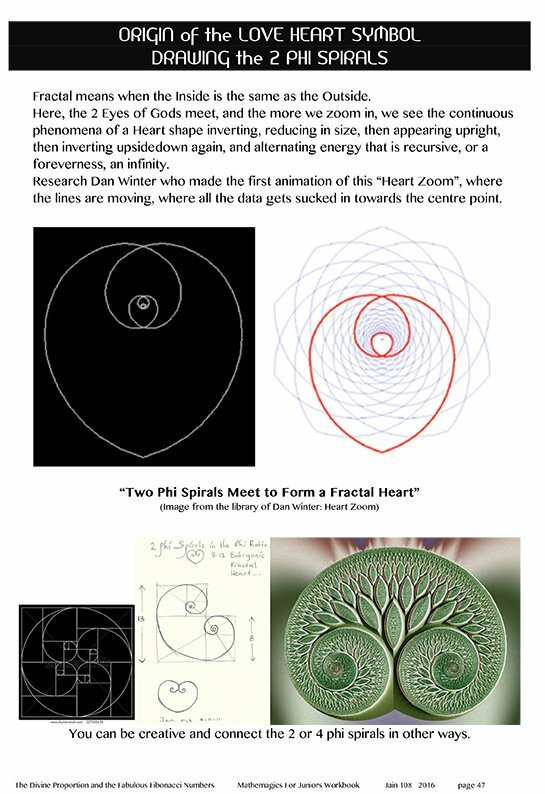 ⦁ Jain talks to the children as if they were young adults, using a highly intelligent vocabulary of words like Torus, Fractal, Platonic Solids, Labyrinth all of which they understand. – Squaring of Fib Nos. 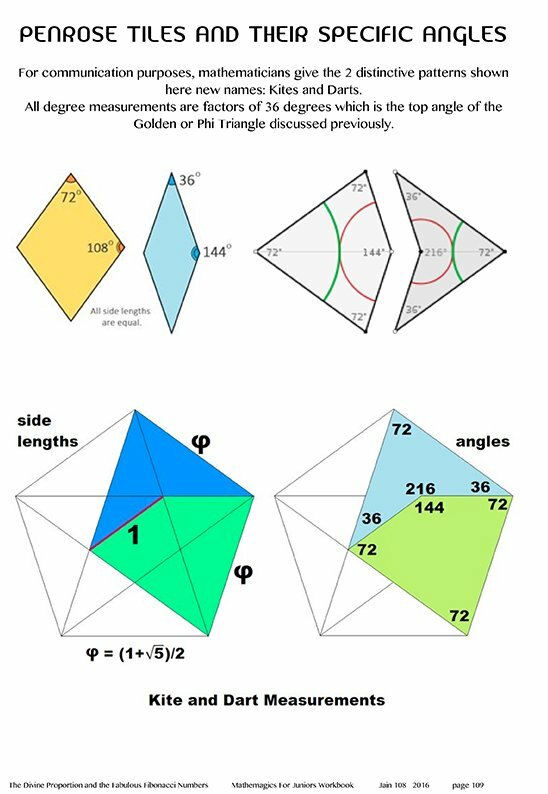 – Golden Rectangles inside the Icosahedron and other Platonic Solids. 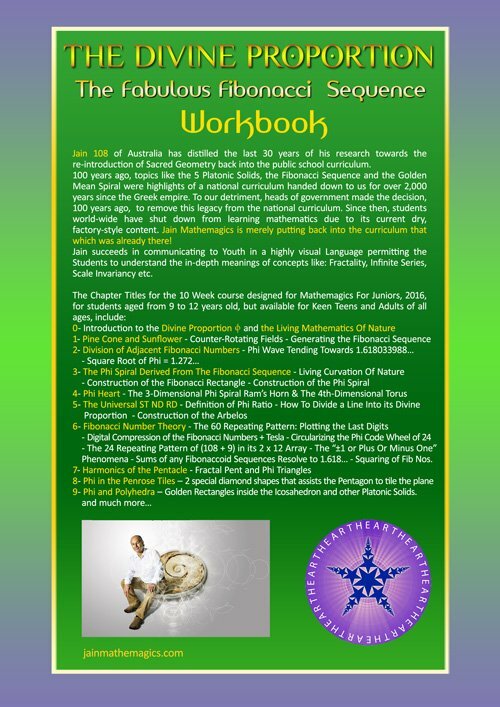 “Enjoy this highly educational and intelligent content of this syllabus that stimulates children and adults of all ages, awakening them to the Memory of Ancient Knowledge”.